« The Season 4 CD: What do you want to hear? 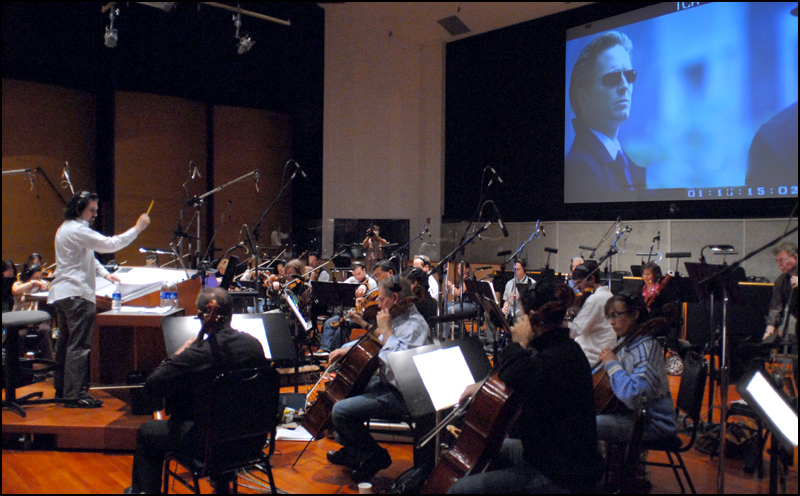 I spent the morning at the Warner Bros. Eastwood Scoring Stage recording my orchestral score for Caprica, the highly anticipated prequel to Battlestar Galactica. I recently composed over an hour of music for the pilot movie and will stay on to complete the rest of the 20-episode first season, airing in 2010. The score, like the tone of new series, is quite different from Galactica. I am introducing a new ensemble, soloists and distinct musical themes, expanding the sonic boundaries of the Battlestar universe, while still keeping the soul of the score connected to my previous work. And don’t worry… Chris Bleth, MB Gordy, Paul Cartwright and the other unique musicians who play on Galactica are on board as well. More details will sneak onto the blog in the coming months, and I will certainly write an entry about the new themes of Caprica once you’ve all had a chance to hear them. Since we recorded today and Galactica comes back on the air tomorrow… I thought all you BG fans would like to know. UPDATED 2-5-09: Galactica Sitrep just announced that the Caprica pilot is coming to DVD April 21, 2009! I told you guys you’d hear my score soon!